Last year, around January we were hit with the Polar Vortex and we got to experience some gelid temperatures for 3 to 4 days with no school. This year I was relieved by the notion that we won't be experiencing that weather again since Polar Vortex is not experienced very often by all regions. But to our surprise, nature expended all the cold on us with lavish dumps of snow so that houses in our development resembled igloos and gave us the intuition of living in Alaska for weeks without even a chance to get melted by the sun. Kids' school was closed for longer than last year. The other day I happened to clean up the snow from the drive way with my kids and the snow pile seemed to get bigger day by day like a huge white monster without compromising to melt by the occasional sun rays. It is still taller than me. Our mailbox is literally dunked in snow. Somehow the mailman finds the opening of the mailbox and puts the mails there. Even if it's gloomy on snowy days outside, I like to bake or make something for my family to keep me motivated and stay away from laziness that this weather offers. I took a day off from work and wanted to spend time with kids. It was a perfect day to bake this yogurt loaf with lemon glaze as the sun was shining bright even though the weather was in the negatives. It is always a challenge for me to bake something sweet during the great Lent which is observed for 50 days till Easter. During this time we omit non vegetarian food. So baking without egg may not always result in the anticipated result. My kids like to see a homemade piece of treat in their lunch box, so I always like to pack them something I bake. Recently I was trying to use up the yogurt I made and tried a plain yogurt loaf with Vanilla flavor. I would say it came out OK, but there was nothing unique or distinct about the loaf which would trigger the wow fact and make me try it again. So I wanted to modify my trial with few twists and I discussed the idea of using lemon in my next trial with my daughter and she was really eager to see the results than me. The citrus punch really did the magic in this yogurt loaf and I was very pleased with the results and texture of the loaf. It was soft and moist and had the perfect balance of tanginess and sweetness. Go ahead and make this egg-less treat for your family or friends. The best thing about this recipe is that it uses the basic ingredients that you can find at home most of the time. In a mixing bowl of stand mixer or regular mixing bowl, beat the plain yogurt and sugar well so that there are no lumps. Now add the baking powder and baking soda by sifting them into the mix and mix well and keep it aside for 10 minutes. Sift the all purpose flour once and keep it aside. After 10 minutes the yogurt mix will start to bubble. Add 1/2 cup of oil, 1 tbsp. of lemon juice and lemon zest and mix well. Now incorporate the flour and beat on high speed for 30 seconds. Grease a 9'' x 5'' loaf pan (refer notes) and line the bottom with parchment paper. Pour the batter into the prepared pan and bake for 45 - 50 minutes till the top gets golden brown and a skewer when tested at the center of the loaf comes out clean. Keep it aside to cool completely. Mix the lemon juice, lemon zest and 4 to 5 tbsp. of powdered sugar well without any lumps to form a thick glaze. Taste and add more powdered sugar if needed. 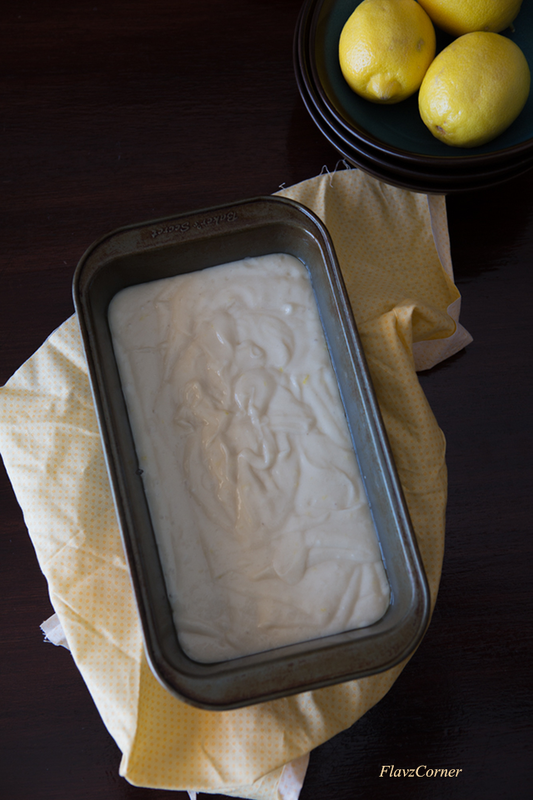 Take the cooled yogurt loaf out of the pan and place on a serving plate. Pour the glaze over the yogurt loaf and give few minutes to set. Make sure to completely cool down the cake before slicing to get the perfect slices. I used a dark non stick loaf pan to bake the loaf, so it took me 45 - 50 minutes to get the loaf done. If using aluminum pans, the cooking time may reduce. In that case you can set the timer for 30 minutes first and add 5 minutes interval till the cake is done. Once done, the loaf will show a golden brown top. Opening the oven in between to check the readiness will result in a cracked top which is not a big deal as we will be covering the top with the glaze. Please adjust the sugar of the batter and glaze per your taste. I used fresh lemon juice and homemade yogurt in the loaf, so I had to use the amount of sugar specified in the recipe for the batter and glaze to balance the sourness from the yogurt and lemon. 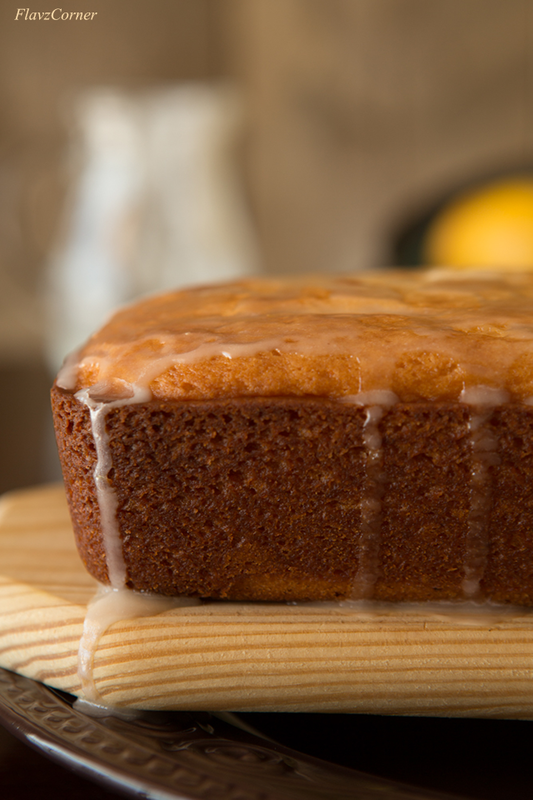 I highly recommend the lemon glaze for this yogurt loaf. This is so spongy and beautiful! 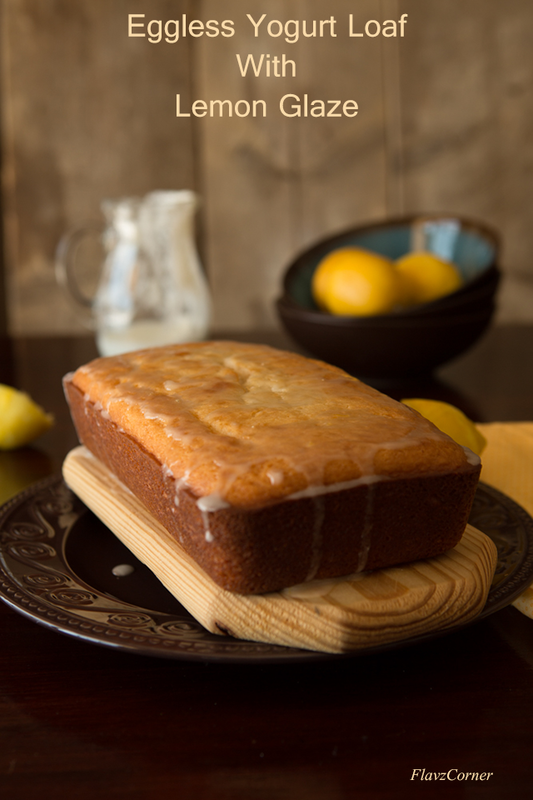 Lemon loaf looks wonderful with beautiful tender crumbs...the glaze looks fantastic!!! 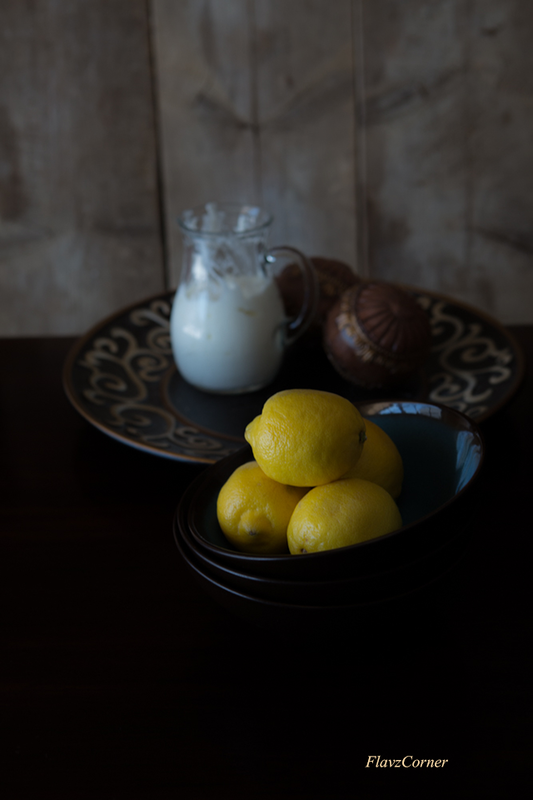 The lemon was a wonderful addition indeed - this loaf looks wonderful inspite of that fact that it doesn't contain eggs! Hmm ..Alaska :( Hope Sun God shows up big and bright soon. I guess we all need something bursting with flavor to raising our spirits. Looks like the cake is perfect for that. Eggless yogurt loaf looks delicious. I should try this cake before the lemon season ends! looks mouthwatering!! The loaf looks amazing. The texture is perfect. I'm slowly venturing into eggless baking and this one is definitely on my todo list. Girl, I feel so sorry for all the crazy winter. I've always wondered how the mailman works, how the routine really happens. It's crazy. I really hope for some good spring weather for you'll. Our February was so cold it might as well have been the polar vortex. :-( This is a great antidote for the weather, though -- so tasty, and with that sunny lemon glaze. Like this, a lot -- thanks. 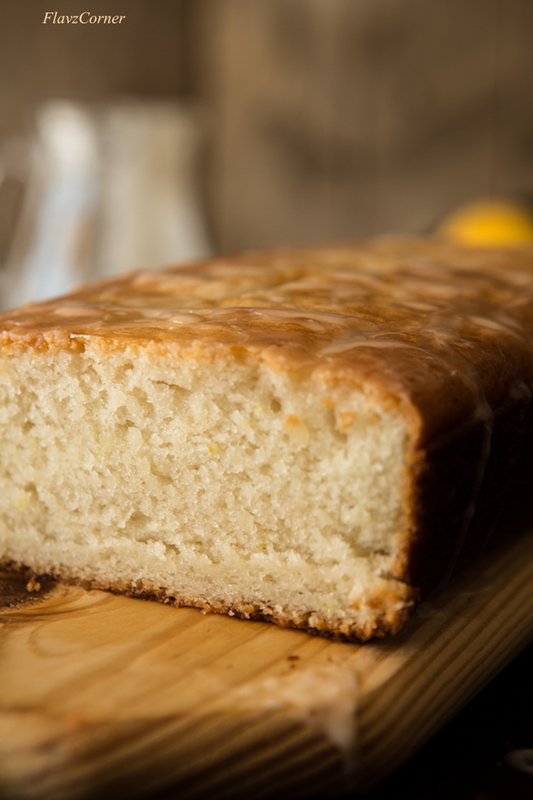 Eggless yogurt loaf, with lemony glaze?!? I need a few slices, please! It looks so pretty and yummy, Shibi. It's a unique recipe, might be so flavorful. ps. : Your photos are amazing, I wish I could learn some from you. That’s one GORGEOUS looking cake. Looove It !!! wow..love d gorgeous cliks dear..
Cant stop looking at the pics...especially the lemons :)..That cake looks super gorgeous.